Ducati’s most thrilling bike just got more focussed. But does that make it more unapproachable than before? 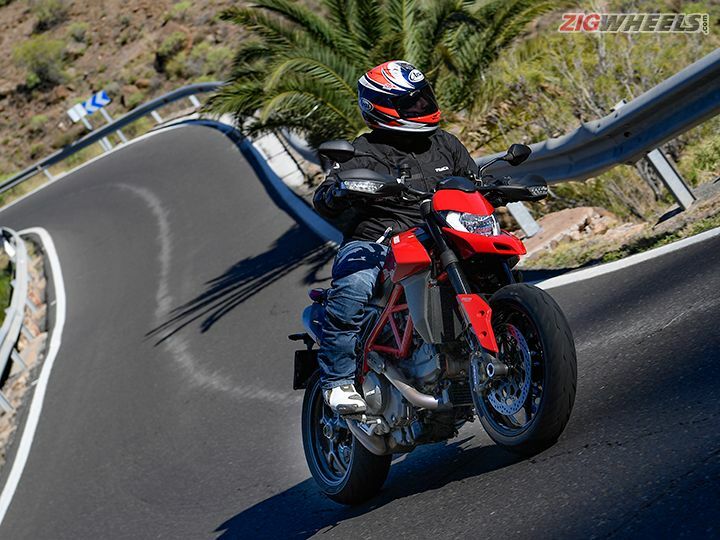 We couldn’t have asked for a better setting to test ride Ducati’s new Hypermotard 950, their self proclaimed “most thrilling model.” The island of Gran Canaria offered up extremely narrow, winding mountain roads, tight spaces through villages and barely any highways to sample the standard bike. And the more extreme SP got its due on the tiny Maspalomas Circuit that’s just about larger than a fast go-kart track. In these conditions, any sportbike, or even a roadster for that matter, would have struggled. To top things off, immaculate tarmac, cool weather and bright sunlight were to be constant companions. Perfect setting then to explore whether making the new Hypermotard more focussed has actually made it more intimidating. How much more focussed has it become? Well, to put it simply, everything has changed. The bike does look pretty similar to its predecessor, the 939, and essentially carries over the engine as well. But what you have here is a proper generational change, enough to qualify the Hyper 950 as a new motorcycle. A big chunk of the changes are to the way the rider interfaces with the bike -- and for this, Ducati has made the seat narrower by 53mm in its middle portion, and also seen fit to extend it up the tank. With no bump stop now for the pillion section, the seat is now flat - one single line (with a dip in the middle of course) from the tank to the tail - truly like a supermoto. The junction between the seat and tank is much narrower now, to better facilitate a leg-out supermoto riding style. And the seat height too, at 870mm, is at fairly intimidating supermoto levels. Now even with my 5’10” frame, I was far from being able to flat-foot the bike. Thankfully though, since the seat is narrow, getting your feet down, while difficult, is still manageable. Finally, to make the riding position more “elbows-out” aggressive, the handlebars have been opened up by 7 degrees. This focus can be seen in the minor alterations to the 950’s aesthetics too. The front “beak” is more pronounced, which along with the newly designed headlight with LED DRLs makes the front end look more aggressive. And we’re very glad that the twin underseat exhausts are back as they really make the back end look more athletic. But what we particularly like about the rear of the bike is how the 2-1-2 exhaust headers snake around the side and under the bike before terminating into the end cans - like the sinews from the hind legs of a large, predatory cat. Ducati’s 937cc Testastretta 11-degree L-twin motor is almost unchanged on this new Hypermotard though. Bore and stroke figures are identical but the compression ratio has been bumped up to 13.3:1; the exhaust valve timing has been reworked; it now new 53mm throttle bodies and the ECU has been recalibrated. The end result of this is a 4PS and 1Nm bump in power and torque respectively - that’s a total of 114PS at 9,000rpm and 96Nm at 7,250rpm. While that might not seem like anything to write home about, Ducati has focussed on torque delivery, ensuring that 82 per cent of peak torque comes in at just 3,000rpm and 88 per cent of this torque is available between 5,000 and 9,500rpm. What this means is that you have plenty of “go juice” in pretty much any gear. Gearing too is really short, so just open the throttle and the Hyper 950 wants to literally leap ahead. And if you do so in the first couple of gears, you’ll find the front-end wanting to climb into the air, sometimes viciously so if you have the riding mode set to Sport. Keep it in Sport and the response of the ride-by-wire throttle seems extremely direct… exactly what you need on a winding mountain road, or even on a race track. This response can be dialled down in Touring mode, but honestly the only place I found myself toggling into this mode was through the villages and when the twisties got extremely narrow and tight. And Urban mode, which limits the engine to 75PS, was useful only in bumper-to-bumper traffic although I reckon I’d switch to this mode on wet roads as well. A lot of the Hypermotard 950’s enthusiasm comes from some weight savings as well. Ducati has cut the pounds wherever possible - switching to magnesium cylinder head covers has saved 1.5kg while trimming the cross section of the trellis frame in places and switching to a trellis subframe has shaved off another kilogram. Throw in some lighter wheels and updated components and you’re looking at a total weight loss of 4kg, bringing the kerb weight down to 200kg. Now that might seem like a lot, but you’d never be able to tell once you’re astride. Ducati has also ditched the 939’s KYB forks for a set of 45mm fully adjustable Marzocchis. At the rear though, you still have an adjustable Sachs monoshock. The agility on offer is incredible. With the extremely competent suspension along with the high centre of gravity (thanks to the tall riding position), wide handlebars that offer lots of leverage and a rake that’s now half a degree tighter (25 degrees), the Hyper 950 is willing to turn on command. Like I mentioned before, the narrow mountain roads on Gran Canaria would’ve severely hampered sportbikes or even nakeds. But the Hyper was more than up to the task, changing direction at the merest push of the handlebars. The bike absolutely loves switchbacks, and even on the stock suspension settings, there was no sign of any upset while flicking it from one corner to the next. And there’s plenty of cornering clearance here too - a mad 44 degrees on either side, with the Pirelli Rosso Diablo III tyres providing huge doses of confidence. Unfortunately, the one thing we really couldn’t put to the test here was just how well the suspension handles bad roads. That’s something we’ll reserve for our India ride. The brakes do need special mention for sure. It packs twin 320mm discs up front with Brembo’s highly capable M4.32 radial calipers to clamp down on them. And it’s got a radial master cylinder too, so brake feel as well as bite is simply exceptional. While in its raw form, the Hypermotard 950 might prove to be more intimidating now, it’s now armed with Ducati’s latest electronics suite based around a 6-axis Bosch Inertial Measurement Unit (IMU). So both the traction control and wheelie control system understand the bike’s attitude (pitch, yaw and roll) and make corrections accordingly. Now while I didn’t have the TC intervene even once, I did get a taste of the wheelie control, which I was able to dial back to level 2 (of 8) as the ride progressed. This did allow the Hyper to pull surprisingly tall power wheelies in first and second gear, it still cut them down rather abruptly. There’s cornering ABS here as standard too, and it works like a dream. You can grab the lever pretty hard when leaned over and the bike refuses to stand up, still maintaining its line through the corner, shedding speed with ease. And while purists might be upset that you can’t switch ABS off completely, dropping it down to level 1 (of 3) does enable “Slide by brake”, which allows the rear wheel to slip by about 10 degrees when you go hard on the rear brake, before electronically reigning it back in. All these systems might seem overkill for expert supermoto riders but it allowed the rest of us mere mortals to really ride hard and have a blast without having to worry (too much). At first glance, the Hypermotard 950 SP doesn’t seem all that different compared to the standard bike apart from its Ducati Racing red-white colour scheme. Of course, at the Maspalomas circuit, our test SPs were running the optional Termignoni exhausts, which did make them look, and sound, a helluva lot more racy. But the real differences lie in the suspension. The SP gets fully adjustable Ohlins at both ends, which offer 15mm more travel at the front and 25mm more at the back. While this does bump up the seat height to an even more intimidating and big ADV bike-beating 890mm, it comes with the benefit of an extra 3 degrees of cornering clearance - that’s whopping 47 degrees on each side! The suspension is significantly more sophisticated too. There were a couple of tight chicanes on the track that were really designed to task the SP’s damping abilities when making the transition from left to right. But even with my excessive weight moving furiously from one side to the other, the SP remained unphased. With some time to set it up for my body weight and riding style, it could be made even better. Then there are the forged Marchesini wheels, which are lighter and make the SP feel even more agile than the standard bike. Thanks to those and some carbon fibre bits the whole bike is 2 kilos lighter, with a kerb weight of 198kg. Apart from that, mechanically, there’s no difference between the standard Hyper 950 and the SP - right from engine specs to electronics. So it’s just shocking how much livelier the SP feels. In fact, the only change in electronics is the inclusion of the bi-directional quickshifter as standard. It not only works flawlessly and with minimal effort, it is actually based off the IMU too. So even if you call in a clutchless downshift when leaned over, the gearbox does so without any drama from the rear wheel. Of course, the slipper clutch, which is now hydraulically actuated, helps here too. Rounding off the SP is a set of Pirelli SuperCorsa SP v3 tyres, which offer nothing short of incredible levels of grip and stupid high lean angles, so much so that most of us were scraping pegs around the track before we even knew it. Well, here’s the tricky part. Undoubtedly, the Hypermotard 950 is heaps of fun to ride, probably more so than most other Ducati motorcycles, at least on mountain roads or tight tracks. But in that sense, it’s a one-trick pony. It is simply terrible at any kind of long-distance riding, and while it is certainly more agile than most bikes through traffic, longer commutes might might feel a bit uncomfortable thanks to the narrow seat. And on a big, fast race circuit, you’d be better of with a proper sportbike. So the Hypermotard makes more sense as a second motorcycle, which is fine in more mature, western markets. In India, where it’s expected to cost about Rs 12.50 lakh when it launches in a few months’ time, its appeal is going to be even narrower. As for the SP, that’s going to be a straight import from Italy, so expect that to cost nearly twice as much as the normal bike. However, if you have the means, even for the standard model, we highly recommend you get one. It’s impractical as hell, but in the right setting, no other bike will put such a big, stupid grin on your face as the Hypermotard 950. Share your experiences with Hypermotard 950?